← Trees, what do we see in them . . .
Glyntland. Though I wasn’t so long in their land as I’d been in Macara, I was away from Madjaria for an equal time for their land was more distant. But once I’d convinced them that despite I’d a womb I’d also a brain, and that though I was a child in their eyes yet I was soon to be queen of my land, my interests there rolled along. My main problem with the Glyntlanders—the ministers, those few I was allowed to speak with—was their insistence on addressing themselves to Hean as if I’d none of their language. That, and that they preferred for me to see such of their inventions that could never be useful to us—but that had been our prime complaint of them. In the time of my grandmother they come bamboozling both king and the Landed with tales of how rich we Madja would grow merely by the installation of a railed-road. They would install. They would provide the required expertise and materials. (Our Landed-lords would provide labour from off their lands.) But all of this, my priests, you must know. They had said nothing—or if they’d said then they’d whispered it—of the fuel needed to power the wretched contraptions. And as to their payment: that has been our worst burden and the main cause of anger against them. My prime objective, in visiting their land, was to amend this situation. First Minister Yournin—whose name I made a point of using, particularly since he seemed unable to remember mine—smiled and nodded at me. Then, like the other Glyntlanders we’d encountered (including the women), he addressed himself to Hean only. “Coal,” I said, drawing his attention back to me. I bit back my retort, that though they might care for the Glyntland environment they had shown a disregard for that of Macara and my own Madjaria. Despite Minister Yournin seemed taken aback by that, yet he now sat back and allowed me to speak—though I thought, at first, he was paying no mind: he would allow me to speak, then drive along as if I’d said nothing. Yet at some point I noticed a look in his eye. Of interest. “In fact,” I said, “I have three propositions. The first concerns our payments to Glyntland in the form of our fruit.” And I outlined to him the suggestion that Madjaria and Glyntland should form a trading alliance. A partnership. “By selling on the open market, I anticipate our half share of the profits will be considerably higher than that which you currently allow us against for fruit-quotas. Half of our profit can then be offset against our debt. If you care to have your numerators check Hean’s figures I’m sure you will find that this trading alliance will fetch for Glyntland a much higher yield of coins. As for my Madja, to see some return on their sweat might incline them to think more favourably of you. You may not answer me yet on this. Yet I shall have an answer before I leave for Madja.” I glanced at Hean. “But of course, that is the simplest use of it. Have you not been using it thus, all these years in storage?” And now he was talking as if I barely was walking. “Ah! I see where you’re going with this. You want hot and cold running water installed in Madjaria. Every home to be supplied. Simplicity itself!” he declared. “No,” I said. “You would have us run when rather we’d crawl. No, my thought was rather to install bathhouses—if I lead the way, install a bathhouse on each of my estates, I am sure my Landed-lords soon would follow.” The idea had only recently come to me courtesy of the facilities at the Ambassador Hostelry where I’d been accommodated. Oh the joys of a warm shower or a bath. So I confess, my first thought was entirely selfish. I wanted to take this installation home with me! “And if we . . . refuse?” he asked, his face now beginning to redden. I smiled my most enchanting. “Perhaps a return of those freighters-full of coke already delivered to us? To be dumped in that pretty green park that fronts this building? Might that persuade you?” Though I have to admit I had not the people nor the vessels to do it. His face had now turned a very rich red. And now, my priests, I expect you are wondering how I came to return from Glyntland when you knew—of course you knew—that an assassin had been sent to prevent it? My Uncle Z’lon arrived on the eve of our departure, puffing and panting like he’d run all the way when in fact he’d sat on his arse for the full eight-days of the voyage. He told me at once that my mother had died. It was not unexpected. But when he said of my father too . . . but he didn’t immediately tell me that. That’s when Landed-lord Z’lon told me the rest. And though Hean held my hand, willing his strength to me, I felt more sickened with every word. I thought I’d been clever, despite the whirl-pit in my head, that I’d understood the machinations of my uncles. But no, I’d been wrong. “Gregon wants the throne for his daughter Jaegar,” Z’lon told me. So we were back to Gregon as Regent. And who would he find to marry Jaegar? Which infant barely toddling would he name as the king? “There is talk it’ll be Lantri’s son Antroni,” said Z’lon. 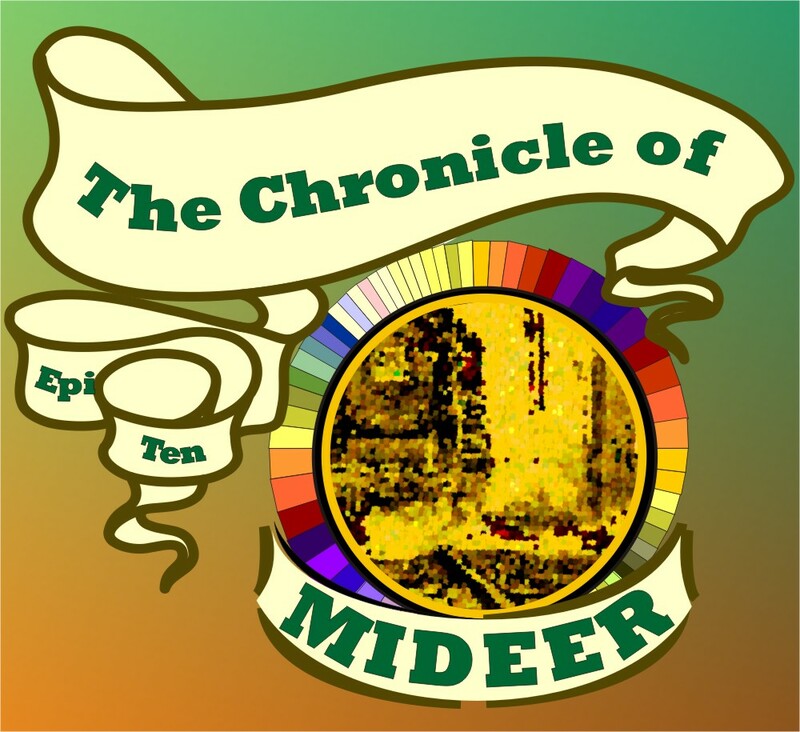 This entry was posted in Chronicle of Mideer and tagged Fantasy, Fiction. Bookmark the permalink. 19th/20th century Earth political economy (as promised), and a coup. Now all I need to hear is that the Glyntlanders helped encourage the coup, if not the specific participants! I can see why you’d expect. But no, and it’s no give-away to say that. And though the Glyntlanders might equate (ish) to C19th/C20th Earth, the Madja are more akin to European C10th/C11th. Thus this coup might be better likened to the Carolingian takeover by the mayors of the palace. Far more in keeping with my historical interests! Yes, even up to confusing which is the legitimate succession. Though it sounds almost more like the Scots in the years following the deal of Alexander III in 1286: multiple contenders, all claiming legitimacy through various types of succession (including one claim of a son’s rights passing up to the father). Oh, this will get more complicated yet. Next I’mm including a Who’s Who supplement so you can untangle the king’s daughters from the queen’s sons. Aye, well, you don’t know who my followers might be. Some very odd ones from very odd places. Not all leave their mark for others to see! Gosh you guys are so smart!! I enjoy your exchanges so much!! Tiz getting complicated and I look forward to all unfolding as it is supposed to in the end.